Still a little while to go before Honda joins the downsized turbo party in a widespread manner, but the announcement that it’ll be deploying two smaller capacity blown mills by 2017 will be welcome news to its marketers and, hopefully, fans of the brand. The Japanese automaker has been slow to make the move along that particular path, but its making up for that with a lot of intent. Just ahead of the start of the Tokyo Motor Show last week, Honda’s European arm announced that the 10th-generation Civic for the continent will be featuring the company’s all-new 1.0 and 1.5 litre VTEC Turbo engines when it makes its market debut beginning early 2017. The engines were originally announced in 2013. Initial details for both units, part of the automaker’s Earth Dreams Technology range, were revealed at the 2015 Honda Meeting that took place at the company’s R&D facility in Tochigi. To recap, the 1.0 litre mill is a three-cylinder turbocharged VTEC unit that looks to have Ford’s 1.0 litre EcoBoost firmly in its sights. The Honda unit is good for 127 hp and 200 Nm (a shade more than the Ford mill, which has 123 hp and 170 Nm), though there’s no mention of rpm points. Whatever the case, its output is 12 hp less than the R18Z1 1.8 litre naturally-aspirated engine it will eventually replace in certain markets, but the new turbo offers a 15% hike in torque, in this case 26 Nm more. Claimed performance numbers – on a Civic – include a 0-100 km/h time of 9.5 seconds and a top speed of 209 km/h, and fuel consumption numbers are bold, 28.06 km per litre being touted, a 20% improvement over the 1.8 litre unit on a NEDC mode test cycle. The unit is said to be an all-new design, but looks to be an evolution of the research 1.0 litre turbo unit that was quietly displayed during the 2012 Honda Meeting at the same venue – in response to my question as to how much had been carried over, the Honda engineers present at the event explained that quite a bit has evolved from the initial development seen three years ago. Aluminium features extensively on the direct-injection DOHC engine, which features dual Variable Valve Timing Control (VTC) and Variable Valve Timing and Lift Electronic Control (VTEC) on the intake side. Other design features include a high-tumble intake port, high efficiency cooling cylinder head, piston with cooling gallery, sodium filled exhaust valves and a variable capacity oil pump. The design also utilises a timing belt in oil, which is again familiar – the 1.0 litre EcoBoost also runs a similar configuration. To aid fuel economy, the unit features an idling stop system. At Tochigi, there was a chance to sample the 1.0 litre VTEC Turbo – which was plonked into a couple of European Civic hatchbacks – over two laps on the facility’s test circuit. There was a six-speed manual, but we ended up in the CVT-equipped mule. The quick impressions were positive; take-up isn’t too laggy, and the response carries on nicely into the midband despite carrying the Civic’s bulk. On the whole, the unit is quite willing to rev, and smoothly at that right up the rpm band. More importantly, it felt more than capable of pulling the Civic along. The competition against the Blue Oval’s three-time International Engine of the Year winner, when it comes, promises to be intriguing. Next, the 1.5 litre unit, which follows on the heels of the 1.5 litre turbo engine that was recently introduced for the US-market 2016 Civic. The unit shares a lot in common with its smaller 1.0 litre sibling, but there are differences – for starters, the compression ratio is higher, at 10.6:1. Interestingly, there’s no VTEC on either the intake or exhaust side of the engine, similar to the mill for the US-spec Civic. Word is that the JDM, USDM and Euro-market 1.5 litre turbo engines all go without VTEC, but the 1.5 litre engine will carry a VTEC Turbo badge in Japan and Europe, omitting this for North America. A quick aside on outputs – there are two different output states of tune (or three, if you consider that of the USDM 1.5 litre turbo version) or variations of the engine, if you will. The tech presentation panel alludes to a 201 hp and 260 Nm output, which is a jump over the 148 hp (at 5,500 rpm) and 203 Nm (at 1,600 to 5,000 rpm) found in the 1.5 litre turbo unit already on sale in Japan, as seen in the Jade RS and StepWGN. The USDM Civic’s 1.5 forced-induction unit, meanwhile, turns out 174 hp and 220 Nm. The different 1.5 litre turbo outputs essentially mirrors that practiced by competition such as Ford with its 1.5 litre EcoBoost. On the Continent, the EB 15 is available in two output tunes, 150 PS and a higher-state 180 PS, the latter seen on the Kuga and, when it arrives here next year, the C346 Focus facelift. In Honda’s case, when it does eventually make its way here, the 1.5 litre we’re likely to see should be the 174 hp unit, taking over from the 2.0 NA mill currently in use now. The 1.5 was trialled at Tochigi in its 148 hp form, via Jade RS mules. There was actually the opportunity to try the MPV out in two different settings, on the ground’s test oval as well as on a small road-going course the next day. On the oval, the 1.5 litre felt sprightly, the power unit happily bring the MPV to speed in quick fashion. In an arena where the Jade RS could be pushed harder and faster, the workings of the blown mill nicely masked the shortcomings in performance from the weaker of the power/drivetrain pairing, the CVT with a seven-speed mode and paddle shifters. On the road-going course, the transmission – which has been specially tuned for the new turbo – felt laggy at points when pushed, though the rubber-banding is far less noticeable compared to something like the NA-powered BR-V. Nonetheless, unless you’re always inclined to stomp on it, the low to mid-end take-up has lots of appeal, as is the intrinsic smoothness of the power unit. The trumped-up Jade variant – which boasts an uprated suspension setup (15% stiffer up front, 20% rear), an electronic Agile Handling Assist (AHA) system that adds brake vectoring through corners as well as a reinforced chassis – itself is quite pleasant to drive, but it’s not going to make it here, according to the folk at Honda Malaysia. Neither, since we’re at it, is the Odyssey Hybrid, which made its debut at the TMS – the company says there’s very little case to argue for it (and the Jade) to be brought in. As it is, the Odyssey is doing about 30-40 units a month, not very compelling numbers to add another two vehicles of such a nature to the local product portfolio. The turbos, however, will eventually get here, though there’s still a way to go before that happens – expect nothing to happen on the forced-induction front here before we go into 2017. Enough time then for followers of the brand to readjust to the idea that small doesn’t mean inadequate, or limp. Later, only big displacement in Malaysia. Hope Honda bringing best engine here in Malaysia. yes it gonna be less FC, is it still have the passion of ‘Enjoy Honda’ slogan ? So why are turbocharged conti cars with smaller displacement allowed in Malaysia then? Good review!! Experimenting turbocharged with CVT is just so wrong. Should mate it with a multi-clutch or manual. Our pariah Government will never allow this car to come in and only give us the 2.0 option. Like Ford Focus, the 1.0 Ecoboost is their biggest seller in Europe. But in Malaysia, the pariah Government only allow the 2.0 Focus in because if they sell the 1.0 Ford Focus, it will have to be below RM80k. Our tax and excise structure for CBU and CKD is such, the higher the CC, the higher the tax on the car. So, if the 1.0 Civic is brought in, the car will have to sell for RM80k and below. Like this, how to protect the dying Proton? Nobody will buy their cars if Civic is sold for RM80k. Also, with the 2.0 our filthy Government can collect more in excise duty and tax and also make more money from road tax. 1.5 ecoboost ford focus is coming in 2016 if i am not mistaken. Indeed lower cc car allowed here, hopefully this Japanese version price cheaper than others. but still I think if tax income from the Roadtax based cc becoming lower, the GOV will find something to cover it up. Like Cigarette & Vape. Let say 2000cc civic sold here for 100k unit per year, roadtax income 38mil. if 100k unit converted to 1.5, they are losing 29mil income per year. Japanese car did big impact on the Auto industry in Malaysia, what if other Japs starter using turbo engine. expected loss > 500mil per year ? Is there possibility they might change tax charged based from engine displacement (c.c) to output power later? the roadtax is tiny in comparison to what they earn in excise duties and gst. furthermore if the manufacturers begin foregoing na engines in favor of turbocharging theres really nothing malaysia as a small market can do about it. Probably tiny to the government, but it means a lot to the already heavily taxed people. 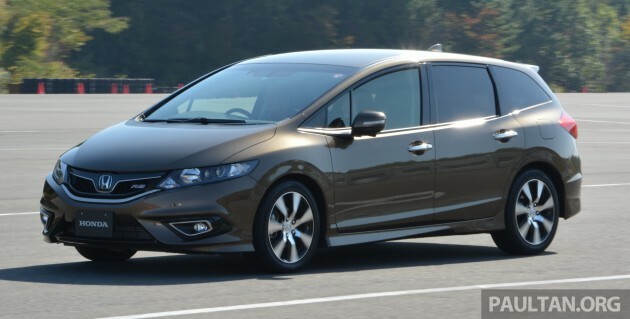 OMG…i hope to see Honda Jade with 1.5VTEC turbo launched here…I expect the sales will be like HRV provided with good pricing. Why no VTEC? Too shabby? Because the engine is force fed. Variable valve timing and lift was invented to increase breathing efficiency for N/A cars where they would need to have a usable torque band stretching from low rpm to high rpm. Basically, what it means is, a single engine cam profile is insufficient to cater for torque you need at 2000rpm and the power you need at 8000rpm. Force fed engine basically forces air into the chambers, negating or at the very least reduces, the need of very often complex and expensive variable valve technologies. Breathing efficiency of a force fed car now depends on the compressor efficiency maps and this depends mostly on compressor/turbine wheel designs and size. So yes, does a force fed engine benefit from variable valve tech? yes, it does, but the difference is much less than that of an N/A engine…very often not enough to justify the cost of it…especially now with new turbo tech like variable geometry compressors. Couple that with emissions and fuel concerns, engines now come with narrower power bands. It is a rare sight today that you will see normal cars with 8000rpm redlines, further negating the need to have variable valve tech on force fed engines. I’m definitely no fan of wet timing belt…..imagine, tali kering/tali yg selalu dlm minyak panas, yg mana putus dulu? FYI. I’m driving ecoboost 1.0 with wet timing belt that soak in engine oil. Can last for 200k KM. It takes minimum 5-7yrs, only you’ll have to change it once. Provided more quieter engine noise. But ecoboost valve noise is louder than others. Also, it less weight than timing chain too. Overall is more pros than cons. Honda Malaysia be like : All new civic 2016 available in 2.0NA, most powerful civic ever! Turbo? Sorry we need more tax money. Excellent writing Anthony Lim, exemplary to other writers. Catchy yet feasible and fun assuming most readers nowadays are of the new era. Look forward for Honda City 1.0 VTEC turbo. It’s sad that Honda omitted valve timing in 1.5L Turbo unit in certain market. Isn’t valve timing can help lower emission, improve FC & better power delivery…. Others Jap makes even had valve timing both intake and exhaust…. What Honda needs to do is to dump off the CVT pronto, honestly, with such good engines, why dump a CVT that dulls the car so so much. Leave that dulling work to Toyota, Honda has been famous for fun to drive cars. After all, it seems Honda has cracked the DCT issues finally, with the 8 speed torque converter DCT as found in the Acura ILX…. An aside, I really wish we can get the Euro Civic. Honestly, it is a very impressive car. A pity we don’t get it. Honda claims that this cvt is very responsive. Check out a video in youtube – zero to hundred in 7.0 – 7.2 sec. timing belt? even p2 use timing chain..
Menteri-menteri yang sangat berotak: Turbo makes noise, need to tax 100% more. if this smaller cc car brought to malaysia, the govt surely rugi of their tax collection. In addition, knowing our local car company being “obsessed” with profit making, squeezing stupid consumers, this car (if it will, one day) will be sold as tin kosong, super-low-spec model, compared to the same car at US. Malaysian are screwed pretty nicely….. This all new civic will only available in Malaysia in 2017 and definitely as always strips off some of the car features during launching. Hate Honda Malaysia. honda still bring in more models then Nissan and toyota here. And they refresh their models quicker too. Well, it shows in the pictorials that the 200Nm is at 2000rpm peak. Previous Post: DRIVEN: 2016 Hyundai Tucson – 3rd time’s the charm?